This year marks the 9th year of LifeSpan Network and Health Facilities Association of Maryland’s (HFAM) 2018 Annual Conference Healthcare NOW! 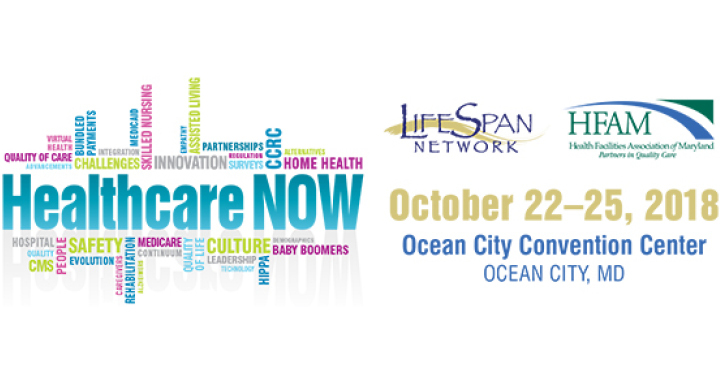 Industry leaders and associated business partners will join together to consider the latest topics and issues in the healthcare industry. “Strategies for Successful Operationalizing Infection Prevention and Control,” presented on October 24 from 4:00 p.m. – 5:00 p.m.
“Purposeful Preparation for Phase 3,” presented on October 25 from 7:30 a.m. – 8:30 a.m.
“The Data Dilemma: How to Use Organizational Data to Achieve Quality Outcomes,” presented on October 25 from 8:45 a.m. – 9:45 a.m.